Judith White, president of Higher Education Resource Services (HERS), third from right, meet with HERS institute alumnae from Wright State: Jennie Buckwalter, left, Jennie Gallimore, Amanda Watkins, Paula Bubulya and Stephanie Goodwin. The event is will feature Wright State leaders including Wright State President Cheryl B. Schrader; Jennie Buckwalter, assistant dean for community and student engagement in the College of Liberal Arts; and Stephanie Goodwin, director of faculty development and leadership. To ensure inclusivity, the breakfast is called “Wright Womxn,” an inclusive spelling of the word “women” that recognizes the intersectional identities of all women, including trans women and women of color. The event is open to all Wright State womxn who are current or aspiring leaders in faculty or staff roles. Registration is required by emailing fdl@wright.edu. Judith White, president of Higher Education Resource Services (HERS): Leadership Training for Women in Higher Education, visited Wright State on March 29 for a breakfast meeting with HERS alumnae who work at Wright State. Wright State has sponsored faculty and staff to participate in the HERS Summer Institute, a preeminent leadership development program that prepares women to become high-ranking decision-makers in higher education. One of White’s goals through HERS is to ensure that the percentage of female-to-male students is the same percentage of female-to-male faculty and staff. Wright State’s student population is about 54 percent female, while women make up about 45 percent of the faculty and staff. 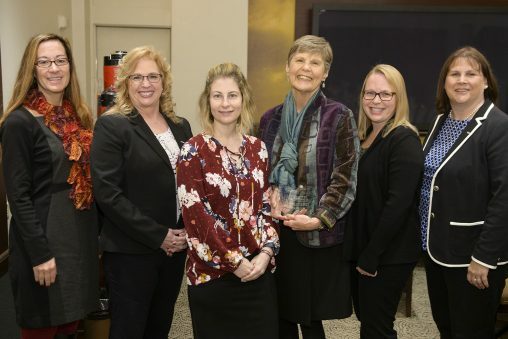 “What I know about Wright State is through the women who have been coming to HERS, I know about their energy and passion that they have about the place that is really dedicated to students and research and the fact that Wright State sends women to HERS regularly to me represents a commitment to gender equity and excellence in leadership, so we’re delighted to see some of those women,” White said. Goodwin said she was excited to see the strength of HERS at Wright State. “There is great depth in leadership represented among the alumnae on our campus. These women have much to offer Wright State as we work to build a strong future for our campus,” Goodwin said. Buckwalter said she thoroughly enjoyed her experience at the HERS Summer Institute in 2015. “HERS helped me learn more about my own areas of strength and areas where I can grow. It also enabled me to reflect on my current career path, gain a stronger understanding of the landscape of higher education and set professional goals for my future,” she said.